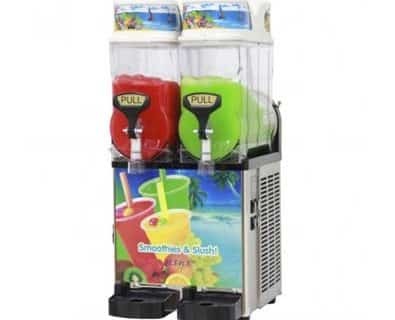 We supply the machine and give you enough mixture that will make 24 litres of slushie (upon freezing 2 flavours) and give you 100 x standard cups and straws with 2 Flavour Bases of your choice & you can either add 1-2 700ml bottles of your favourite alcohol such as Vodka, White Rum, Tequila as suggested or keep it alcohol free for the younger ones. All you have to do is provide a flat table and 240v power outlet and will do the rest. All our flavours can be served as mocktails or cocktails. for alcoholic cocktails add between 1-2 bottles of spirit (700ml for every 12 litres cocktails. Just add Vodka to Fruit Tingle syrup to create a delicious fruity cocktail ! Just add Malibu or Bacardi to Pina Colada syrup & you’ll feel like you’re in Hawaii! Add half vodka & half Malibu to Illusion syrup and taste the melon! Just add vodka to Blue Lagoon syrup and sail away with this bright, fun cocktail! Just add orange liqueur to Illusion syrup to create this refreshing cocktail! Just add Vodka to cosmopolitan syrup to make this old time favourite! Just add tequila to Margarita syrup to make this tangy cocktail! Just add half Bacardi rum and half Vodka to pineapple syrup to make a fruity martini! Just add Gin to orange syrup to make this fun cocktail! Just add Bacardi rum and juice from a fresh lime to any of the Strawberry & Mango fruit flavoured syrups. Just add 1L vodka & 1L of cranberry juice to Pineapple syrup to make this refreshing cocktail. Mix vodka, baileys and kahlua with milk and Neutral syrup to make this delicious, creamy cocktail! Just add tequila and fresh lime to any of the fruit flavoured syrups to create a fruity sensation! Mix 800ml Vodka and 200ml Cointreau with tropical Syrup to make this delicious summer drink! Mix 500ml of white rum and 500ml of midori with our Pineapple base to make yummy frozen splice.